Unnecessary waste products sneak into our leaves in the most invisible little places – take the kitchen sink for example. Most people will have an array of steel and/or plastic sponges and scrubbers hanging around to wash their dishes. These, of course, all eventually end up in the bin – AKA landfill. These days there are a vast range of kitchen scrubbers in the eco-products department that you can buy which break down in the compost pile which is fantastic. But did you know there’s pretty much always something you can grow yourself that will do the same job? 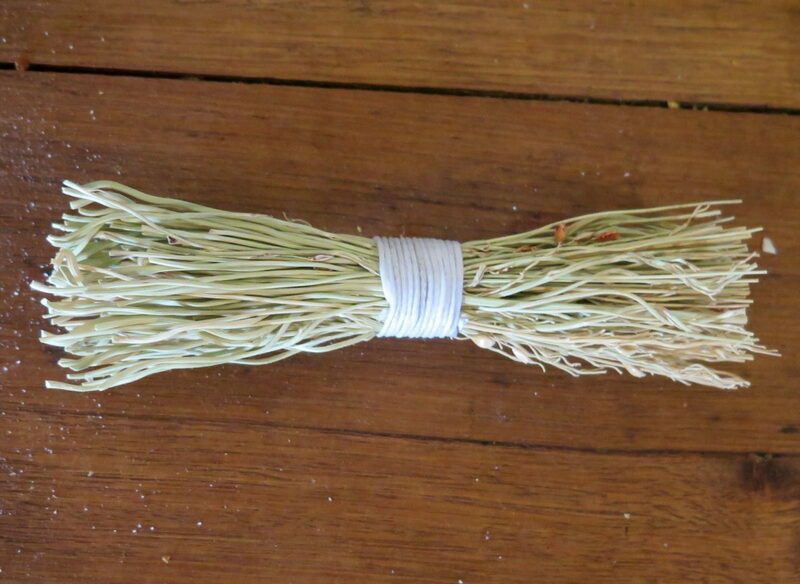 Growing up in sub-tropical Brisbane, we’d grow the luffa vine and use this in the bathroom and kitchen. In more tropical climates, people use coconut husk. 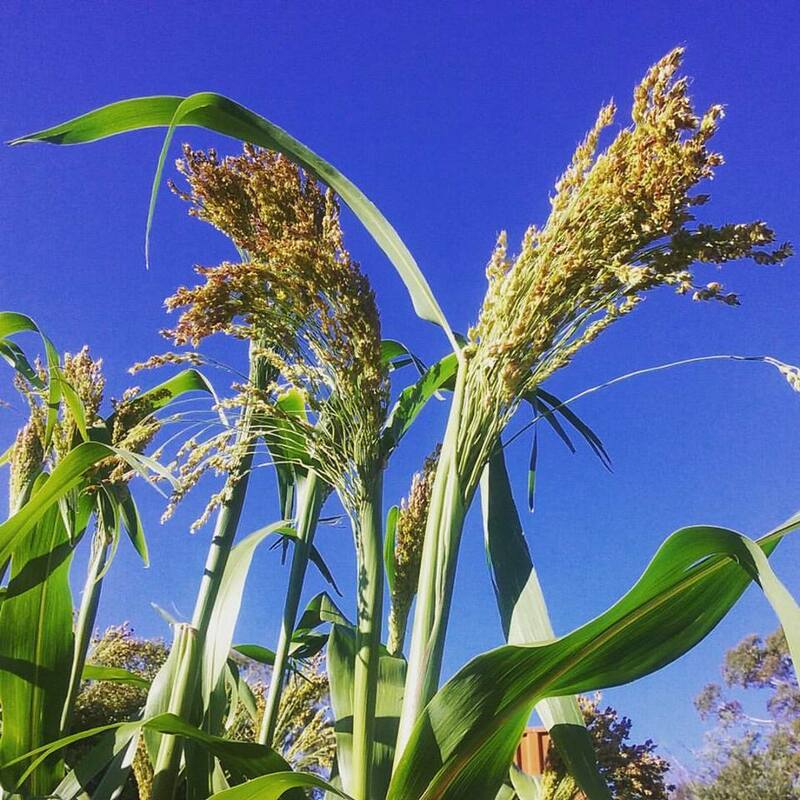 Alas, it’s a tad cold in cool temperate Tasmania for either of those plants – hence our enthusiasm when Anton’s mum gifted us with a little broom millet (Sorghum bicolor) scrubbing bush all the way from (very cold) Sweden. 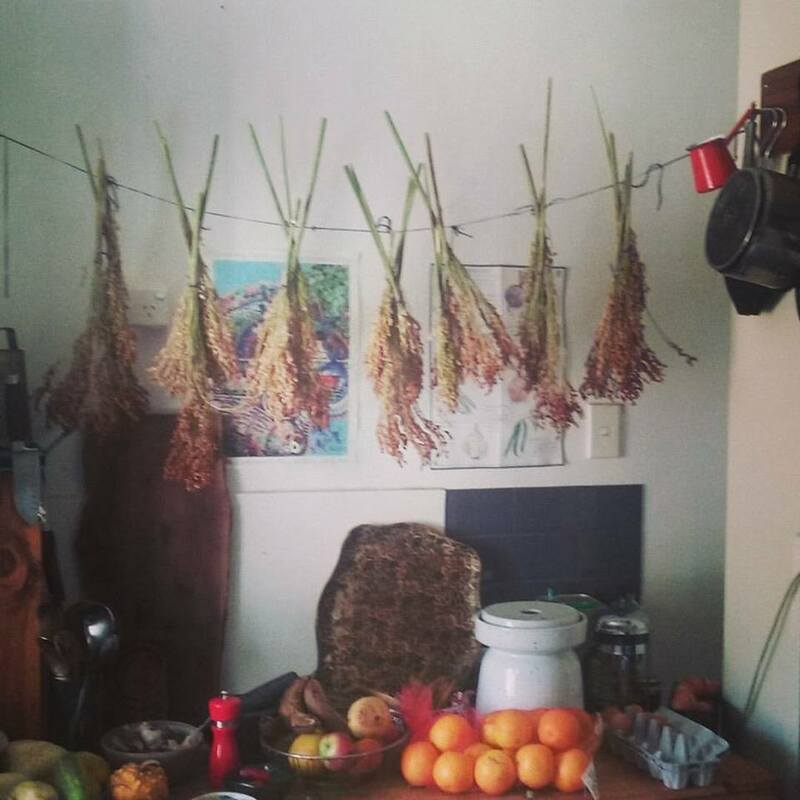 Harvesting and cleaning with Frida Maria. Hanging to dry in our kitchen. 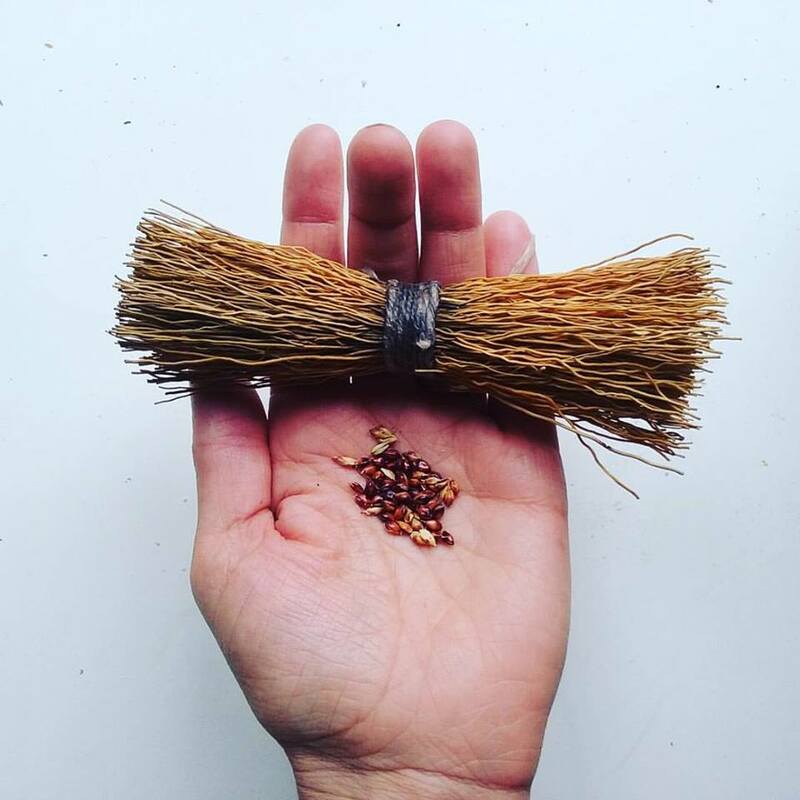 Once you’ve grown, harvested and dried the seed heads thrash the seeds off the plant and save it for eating and/or for growing for next seasons (that’s what we’ll be doing). 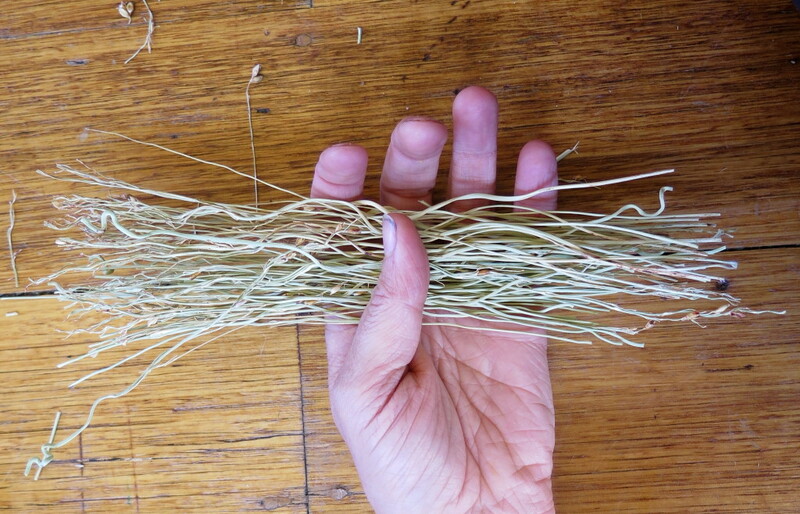 THEN… Cut it into desired lengths and form a nice little bunch in your hand. Next you simply have to tie some string around it to keep it all together. We recommend using a waxed string as this repels water, preventing the string from becoming smelly with excess water hanging on. I just went ahead and roughly wrapped the string around and tied ten knots to keep it on. Then Anton walked into the room and proceeded to wow me with one of his sailor knots where it’s beautifully neat, you can’t see the finished knot and it’s approximately 100 times stronger than mine…. So I think you should know about it. 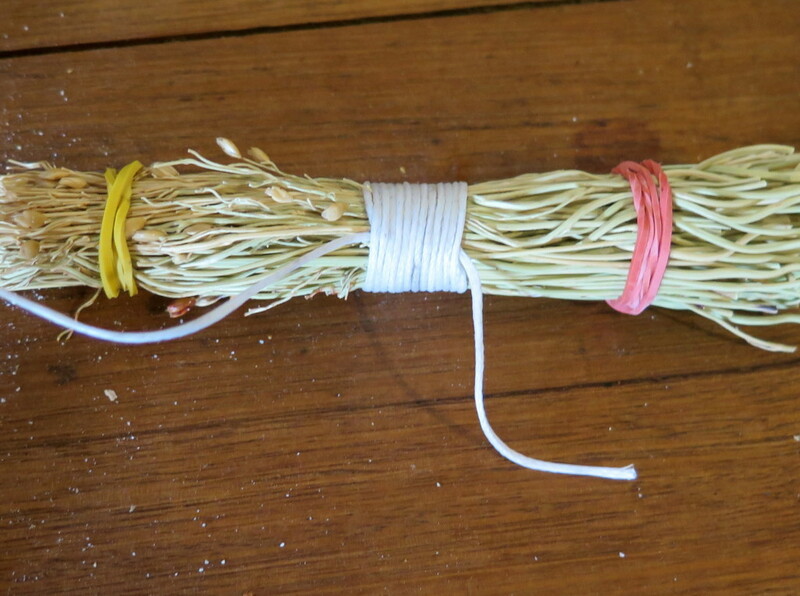 First, use some rubber bands (or equivalent) to keep your millet in place. Then lay the string out as seen below. Next, start wrapping your string neatly around your bunch, leaving the loop exposed at one end (the right in this case). Once you’re happy with the amount of wraps (i.e. run out of string), put the end you’re working with through the exposed loop. 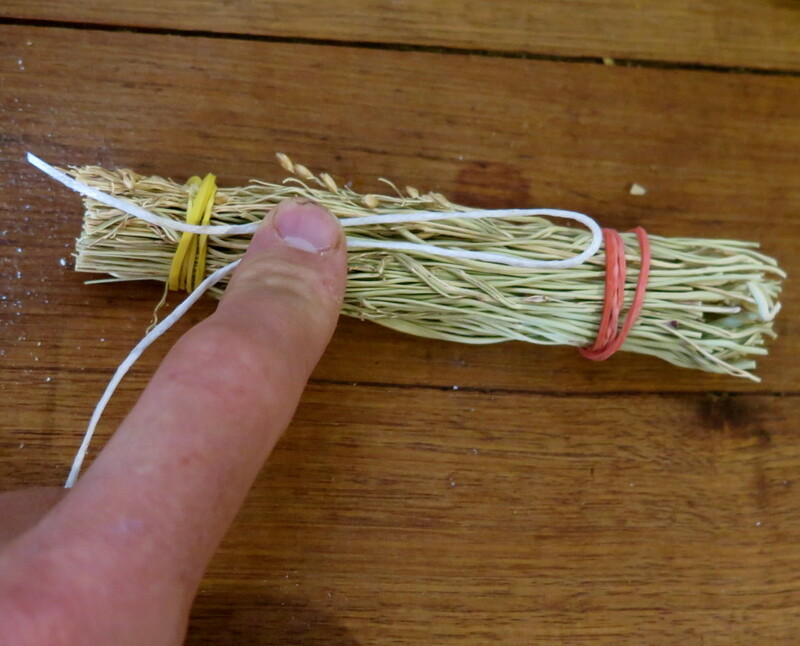 Gently and slowly, pull the other loose end of string (shown on the left in the photo below) until you’re pulling the looped end under the wrapped area. 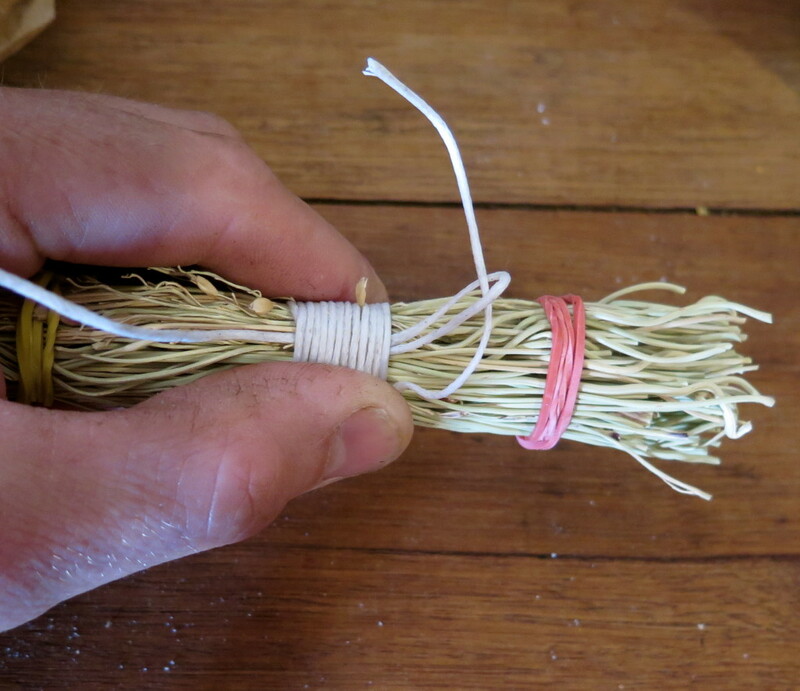 By doing this, you’re making a knot which ties off the whole thing. 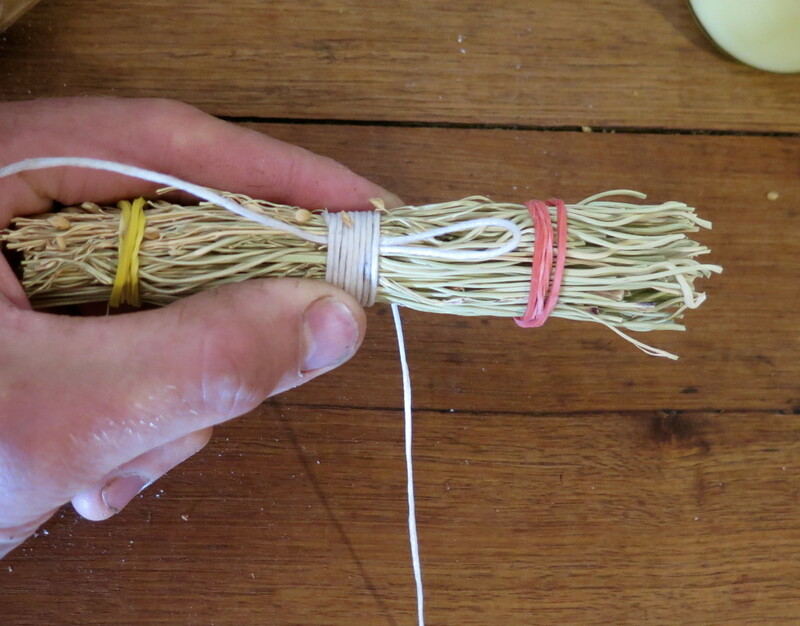 You’ll be left with two bits of string sticking out from either end of the wrapped area – just chop them off, remove the rubber bands and you’re done! 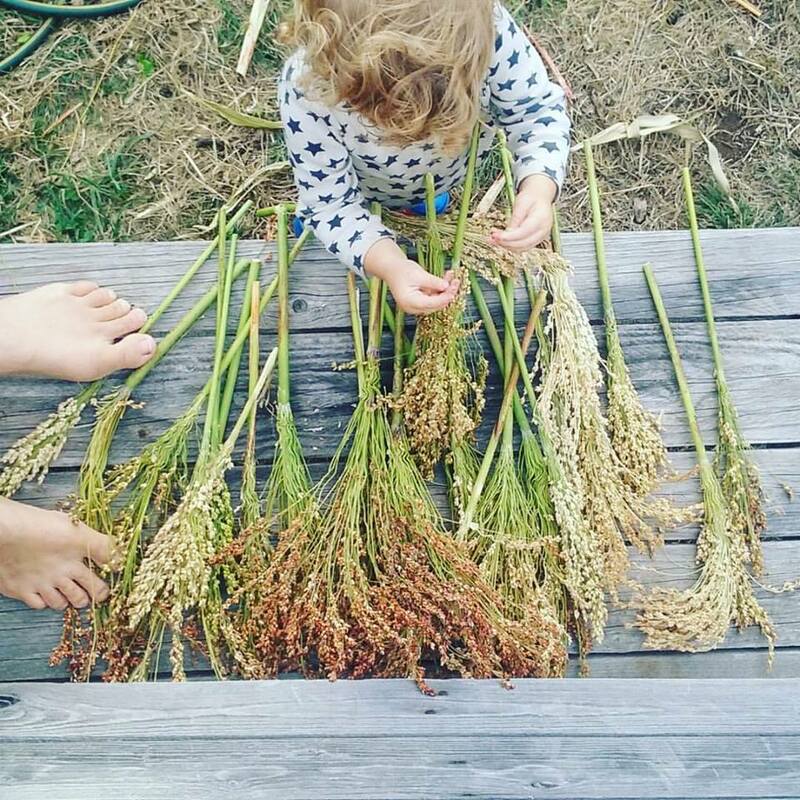 The patch of broom millet we grew was around 3m x 2m with approximately 25 plants. Of those plants, some seed heads were lost to birds and some didn’t form overly well. 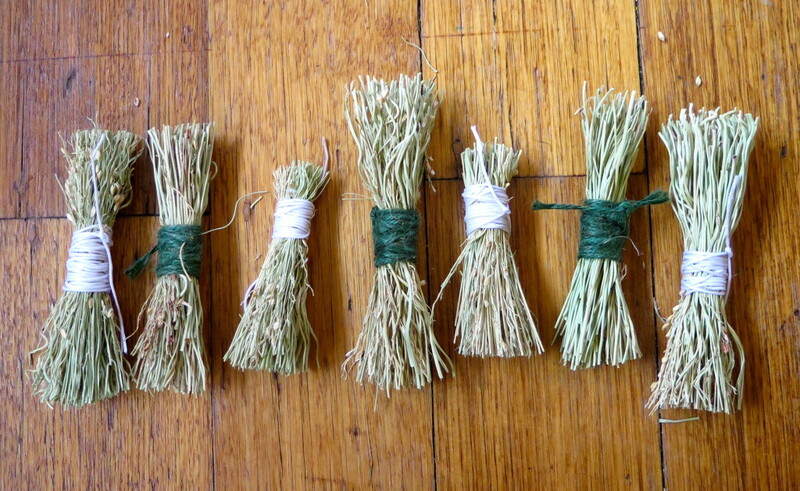 We ended up with seven scrubbing brushes from around 15 plants. But interestingly, one scrubbing brush will last for over one year – we’re still using ours that was gifted to us well over a year ago. I’ve had to replace its’ string once, but otherwise the fibre is incredibly strong and still going. Technically this means we have over seven years of scrubbing brushes in the photo below! We trialled some different shapes (short and long) to see what we prefer. Please note, all the bunches above are tied together using my slap dash technique and they’ve since been re-done using Anton’s sailor knot as shown earlier in this post. The green string (seen above) is hemp which works fairly well, however we prefer waxed string which repels water and therefor lasts longer. While it took a while, we’re now very sorted in the scrubbing brush department. Say goodbye weird plastic products and hello compostable, uber local and satisfying resources! Beer! I don’t need to sing its praises but I think folks should know a bit about how it’s made, especially once you find out how amazing it can taste *and* how much money you can save from brewing your own. 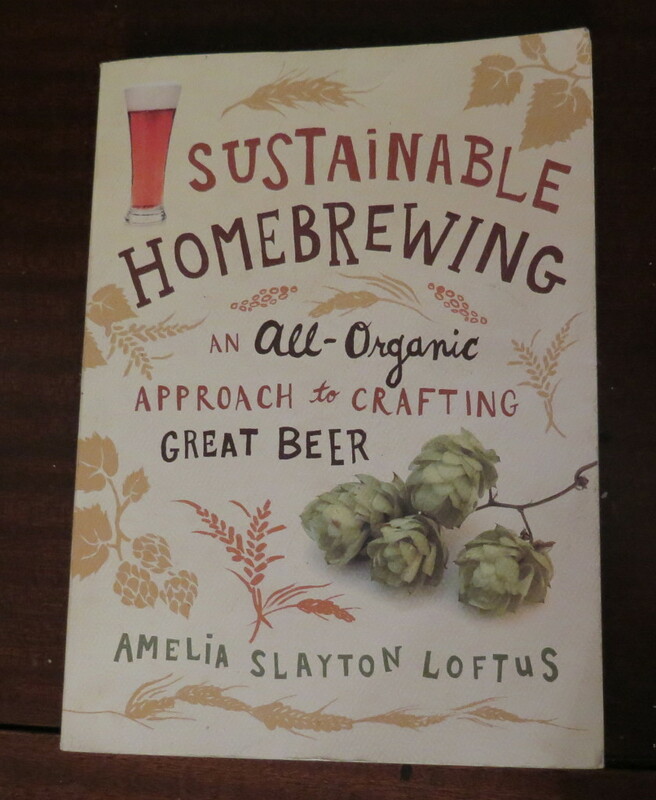 Perhaps it was one of these “slap dash” home brews that inspired Hannah’s dad to give us the very excellent “Sustainable Homebrewing” by Amelia Slayton Loftus. 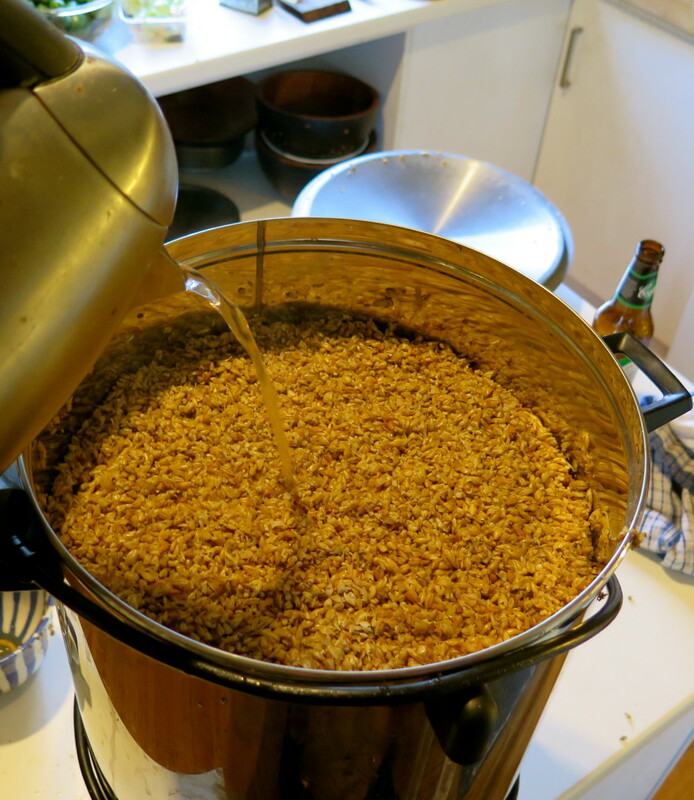 This remarkable read introduces homebrewing and takes the reader through the entire process of brewing beer, using whole grains and developing your own beer styles. She also takes it to the next level with mushroom cultivation on the spent grains and even DIY vegemite…yep – she’s awesome. From reading this book I’ve learnt something extra about every aspect of the brewing process, deep details on the malting enzyme process or little tricks of what temperature to keep your mash for sweeter beers. She also has a bucketload of award winning recipes, from simple beginner beers to over the top trophy winners. If you’re interested in taking up home brewing or taking it to the next level I heartily recommend this read. I got so inspired by this book that I thought I should share the process of making beer from scratch (without the growing and malting barley bit). This process is known as a “full mash” in brewing circles. 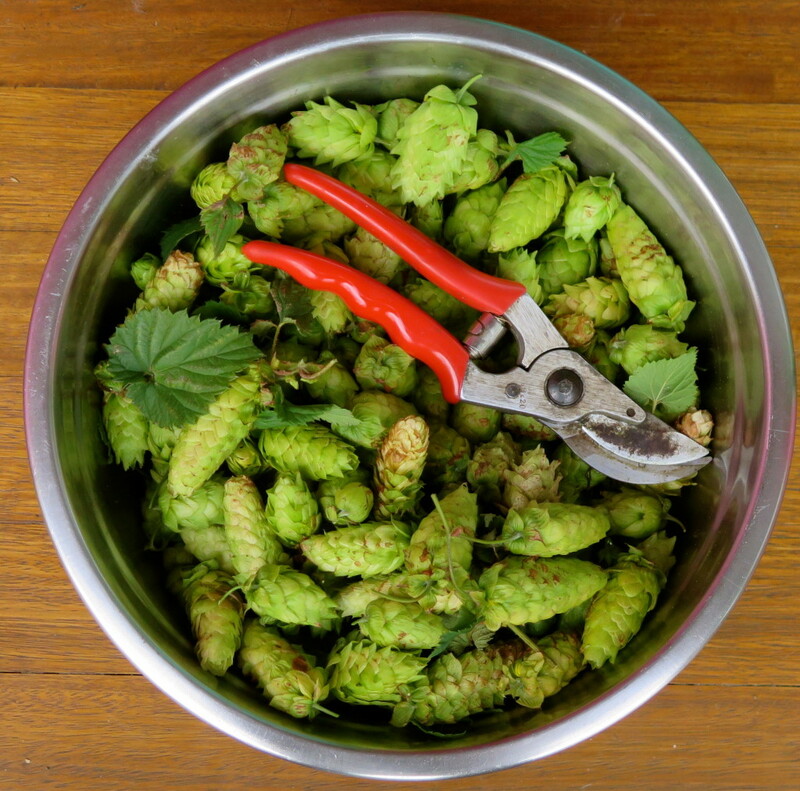 First up – grow some hops. 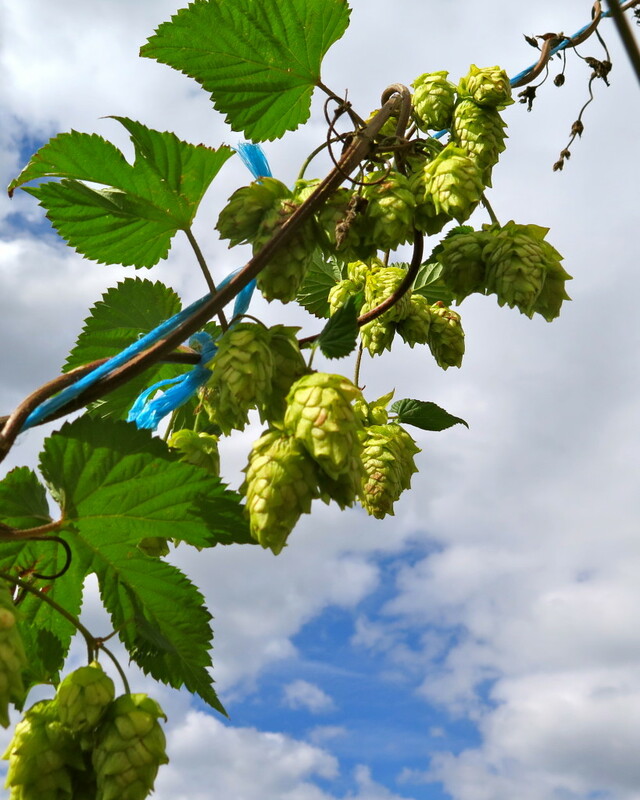 In temperate and cool temperate hops grow like crazy, getting to over 5 meters tall in a season. The vine is cut down in autumn and hop flowers harvested and dried. Of course, alternatively you can buy dried hops. Cascade hops growing amongst our orchard. The first step in the actual brewing process is weighing your malt and placing it into hot water. It’s steeped somewhere between 65-68 degrees celsius for around 1 hour. This process extracts the sugars from the malt into the hot water. I like to use a “hot box” to steep the grains. 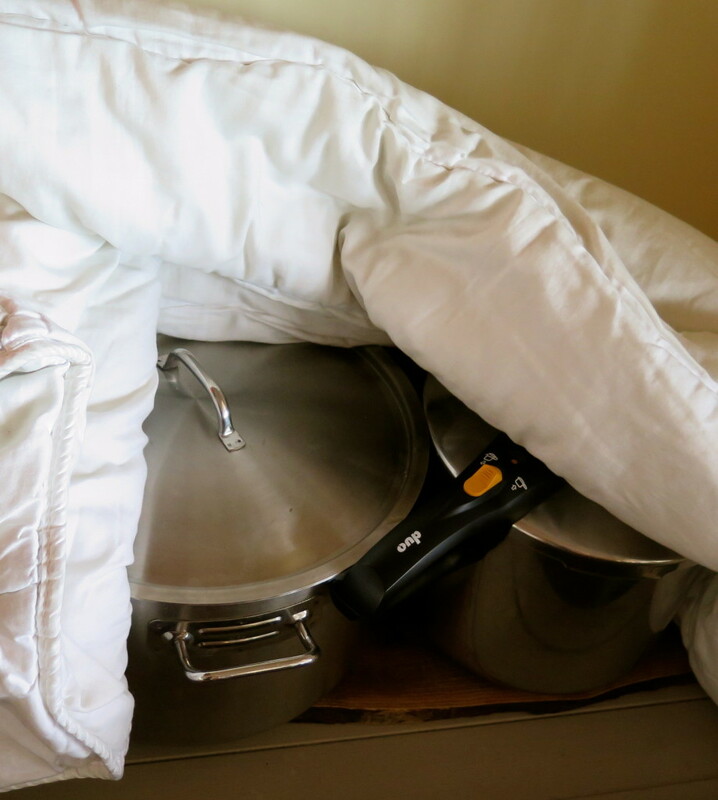 Once the grain and water are at the upper limit of the correct temperature they are wrapped in blankets, doonas and pillows to stay warm. 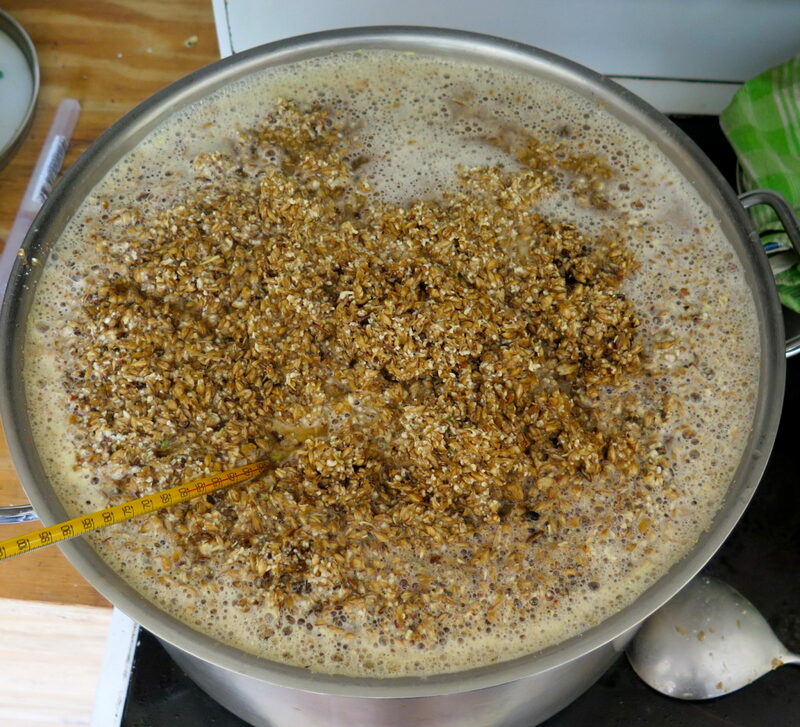 The next process is called “lautering” – basically trying to get the sweet malty water separated from the grains. Here we have press-ganged an urn into service. It has a “false floor” consisting of an upturned collander and cheesecloth. Hot water (around 75 degrees) is poured in the top and malty water drained from below. This keeps on going until you have washed as much sweetness out as possible. More recently I’ve been doing the entire first malting process in the urn. It saves one whole process of transferring hot liquid in heavy saucepans. It’s also worthwhile to note that brew shops are full of specialty brewing equipment – so you don’t have to have to improvise with your kitchen implements. Most of these purpose-made tools would make your brewing process easier, but definitely more expensive. The next step is boiling the “wort”. That’s the name given to this sticky sweet liquid. 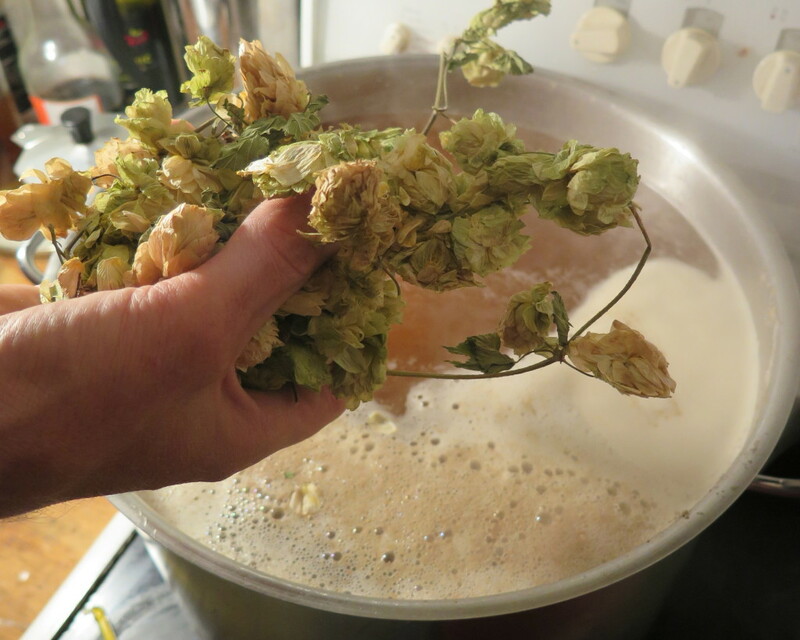 Over the course of around one hour a variety of hops are added to the wort. 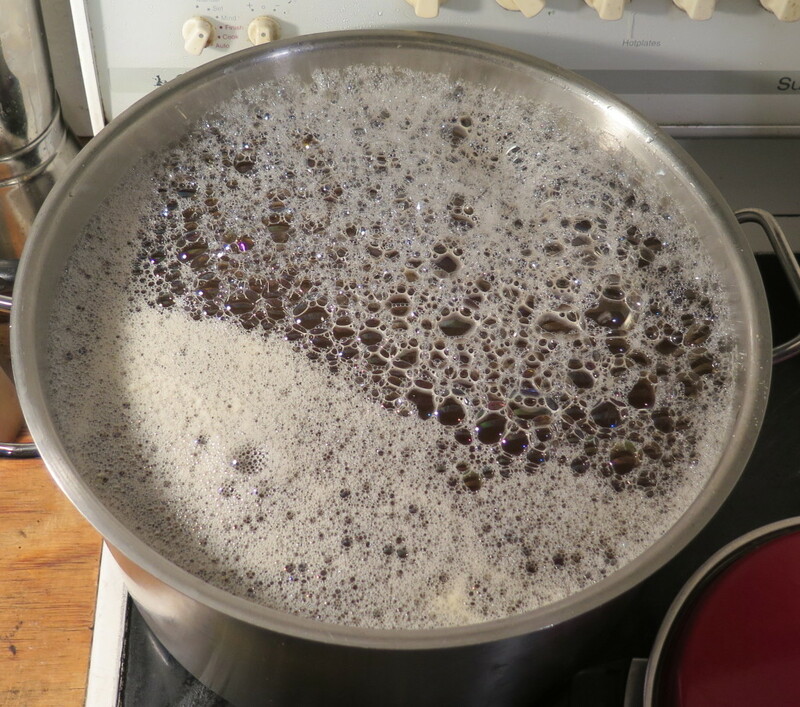 Boiling the wort also sterilises the it, ensuring your preferred yeast strain flourishes. From now on, you should be concerned about sterilising everything that touches the brew. Next up, you can start adding your dried hops which are the bittering and flavouring agent – they also help to preserve the beer. 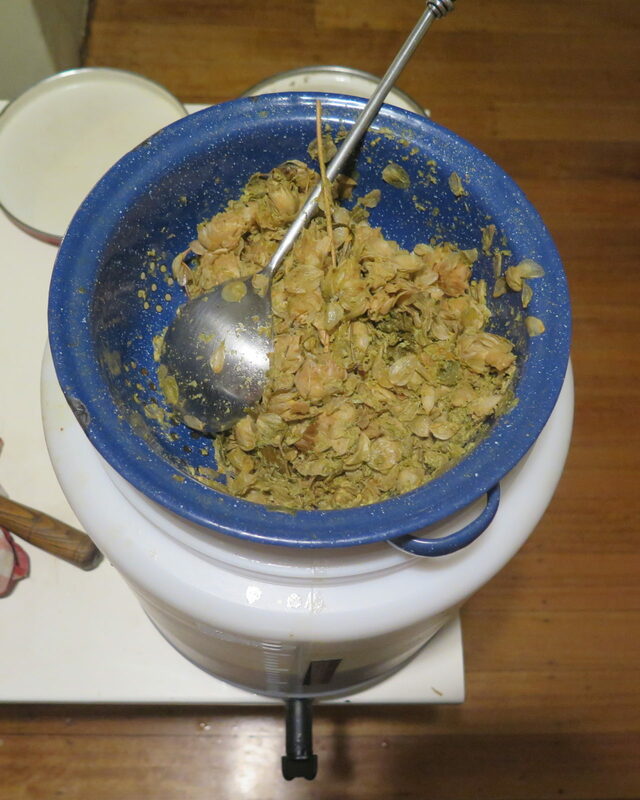 The amount of hops, the timing of the addition and the variety will contribute greatly to the final taste of the brew. Hops are added in stages over an hour, this allows different flavours to develop in the boil (much like tea has different flavours the longer it is left). Also note that different hop varieties have different flavours and amounts of bitterness. Be careful when starting out because too many hops can turn a good brew bad. After the wort has boiled it’s strained into a brew barrel – I use 25 litre plastic barrels, but glass carboys work as well. At this point we need to cool down the wort as quickly as possible. I place the barrel in a large tub (actually baby bath) and add cold water. 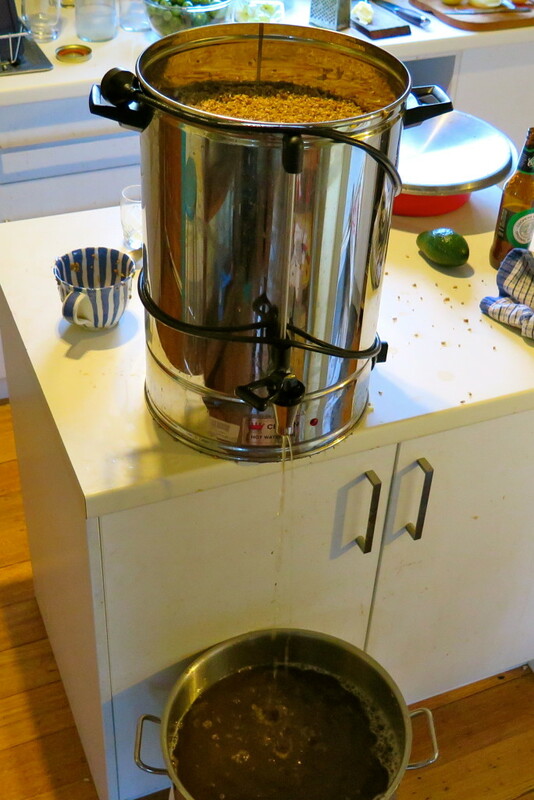 This approach creates a lot of surface area to cool the brew, it usually takes around 30 minutes. Once the wort is cool, I give the brew a strong stir to introduce oxygen and then add brewing yeast. Brewing yeast is available in packets from brew shops. It’s also fairly easy to use the remains of a previous brew batch to start the next brew, or even recover yeast from shop-bought beers. Be careful with this process because contaminated yeast can make the previous hours of hard work turn to vinegar – you have been warned. It normally takes around two weeks for the brew to do its “primary fermentation”. At the end of this process all of the available sugars have been converted by the yeast into alchohol. During this process it will have released carbon dioxide and if you have installed an airlock on the brew barrel you would’ve heard it bubbling along. After the brew has stopped bubbling it’s placed into bottles along with a small amount of sugar or malt. This addition of sugar is the “secondary fermentation” and as the yeast releases carbon dioxide it’s trapped in the sealed bottle and makes those refreshing bubbles we know and love. Its a good idea to label your beer, a marker pen on the lid does the job. 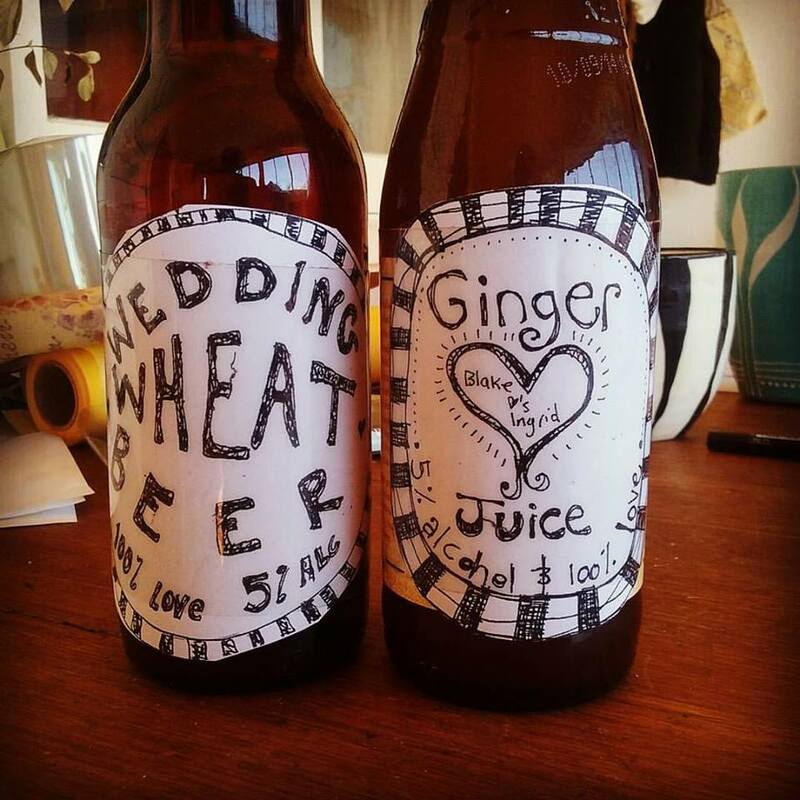 Or you can make some special labels, below you can see some bottles we prepared for our mate’s wedding. 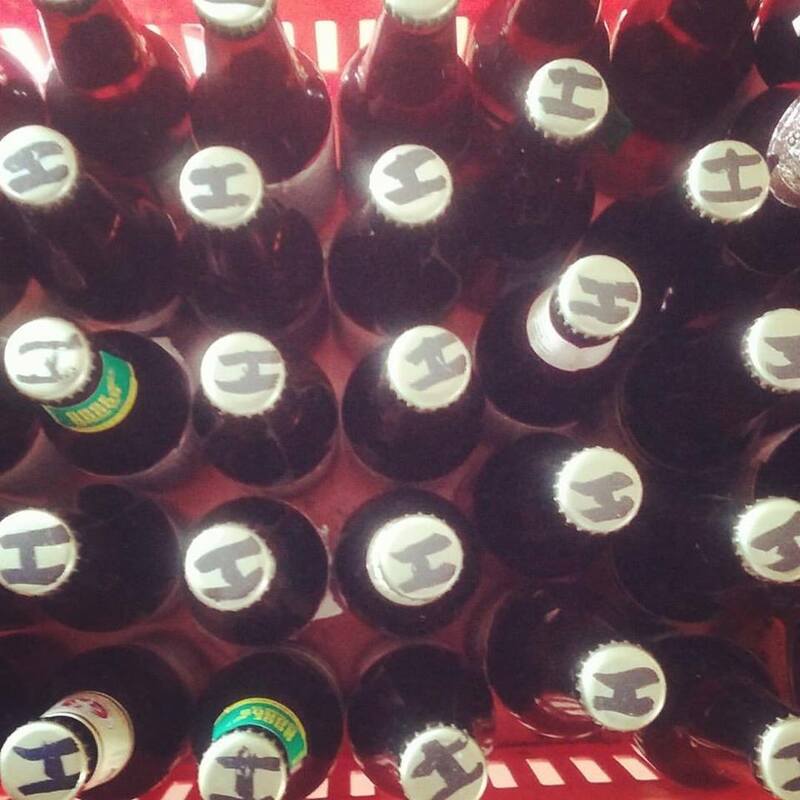 The joys of homebrew are endless – from making it to sharing it with mates, it just keeps on giving. It’s one less thing we buy and one more thing we make – adding to our home-based approach to living. Taking responsibility for our needs is one of the most satisfying things for us, and while beer isn’t technically a “need” it’s a perk of life we like to enjoy every now and then (preferably with excellent humans). And obviously, we advocate for sensible and smart consumption – look after your brain cells and keep it all in moderation :-). By the way, you can check out our educational tea towel on how to brew your own beer HERE! Meet Shani Graham and her partner Tim Darby. Together they live in on a 1/4 acre block in Fremantle, Perth, Western Australia. Their home (and local business) is called Ecoburbia and is an urban infill development where they’ve converted their house into four self contained living unit, tripling the population density without adding to the houses footprint. They’ve set up their home as a demonstration sustainable house, with cutting edge energy systems, water collection and dispersal systems and innovative passive solar design.They’ve designed it to be an educational opportunity and community hub, with regular tours, workshops, films and other community events. On top of this they’ve also got chickens, goats, compost and fruit trees, plus a large shared veggie patch. Yes goats – you read that right. As a wannabe city goat keeper myself, I had a million questions for Shani and thought it only right I share the answers with you – and the cute baby goat photos… Swooon! What type of goats do you have and why did you choose this breed? We have two saneen goats,the mother is Little White and her daughter is Whimsy. We chose them as they’re are a great milking goat, have gentle natures and are generally pretty quiet (unless they are on heat). How big is their permanent run? ​A​bout 50 square metres not including their stable area. What are some of the key functions they perform for you and your property? The goats do a few things – ​most importantly ​provide us with milk – we drink this and make cheese. They also provide a composting system for branches cut around the neighbourhood. Importantly, they’re a gret source of entertainment (and sometimes shelter) for the chickens. ​interestingly the chickens like to eat the grain in their poo – so that’s another function, plus they eat food scraps from us and many of our neighbours and friends. Lastly they are an endless source of love, entertainment and fun ​for us, just like any other pet does. Do your neighbour’s like them? The majority of our neighbours love them – especially when there are baby kids around! Does your local Council approve of them? 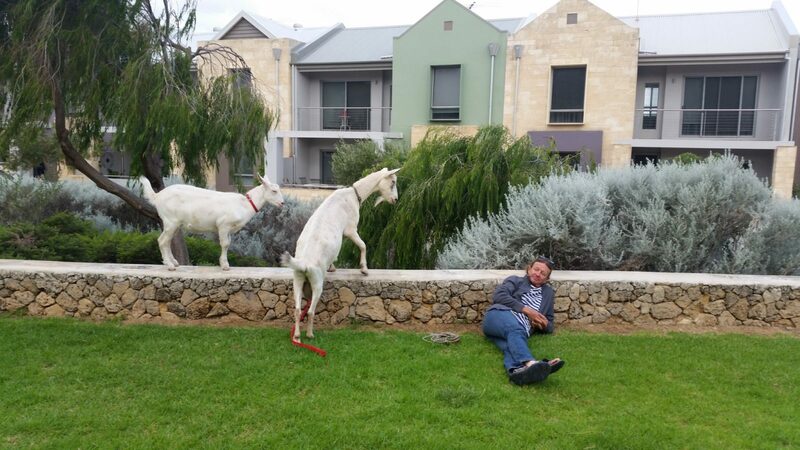 ​I am proud to say we have the only legal goat stable in Fremantle! Interestingly enough (despite what everyone says) we met all the requirements (we are on a 1/4 acre block), except distance from our neighbours. But our council was very reasonable and suggested that if we could get support from all our affected neighbours they would grant approval – which they did. We have had goats “illegally” before. We find when applying the “beg for forgiveness don’t ask for permission”rule works quite effectively. The most important thing to do is talk to your neighbours – and offer them goat’s cheese! They get a grain mix twice a day – this consists of lucerne chaff, special goat pellets, barley and lupins. Plus oaten hay and occasionally lucerne. 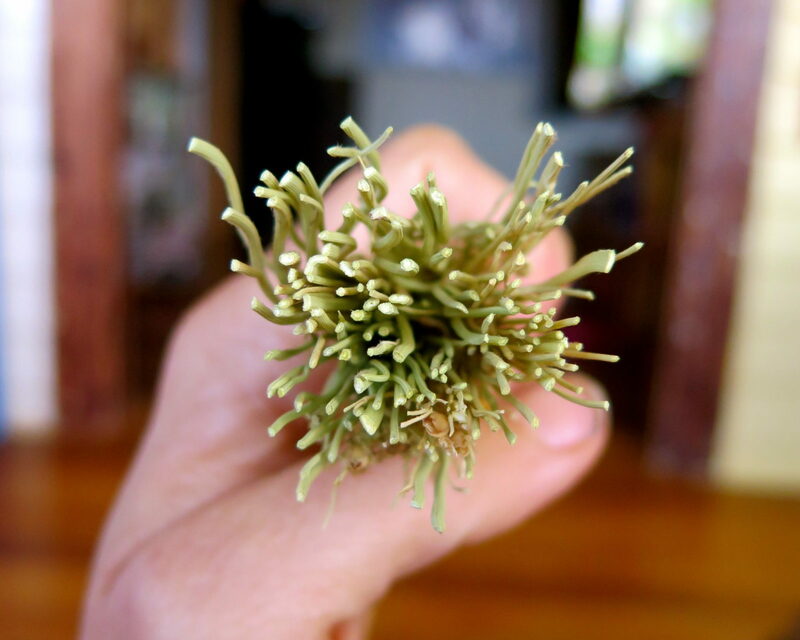 They also get whatever branches are being cut down and every second day we harvest some acacia from a local roadway. How much milk do you get from them each day when you’re milking them? When Little White was in full production we got between 4-5 litres a day. We have been milking her for nearly two years at the moment though so she’s down to about 2 litres a day. 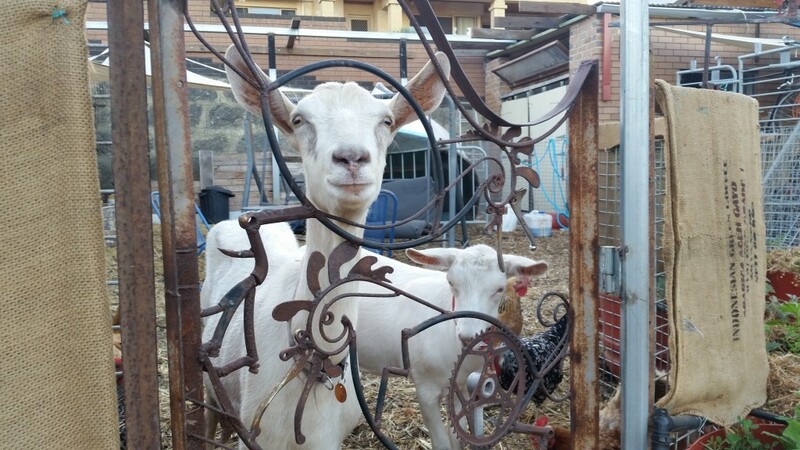 What type of fencing do you have for your goats? We are really lucky, our goats are not really escape artists so our fences are not that high (around chest height) but pretty sturdy​. Whimsy can jump out if she is scared but she doesn’t seem to do it any other time – she is really scared of umbrellas for some reason and that is the last time she jumped out​. 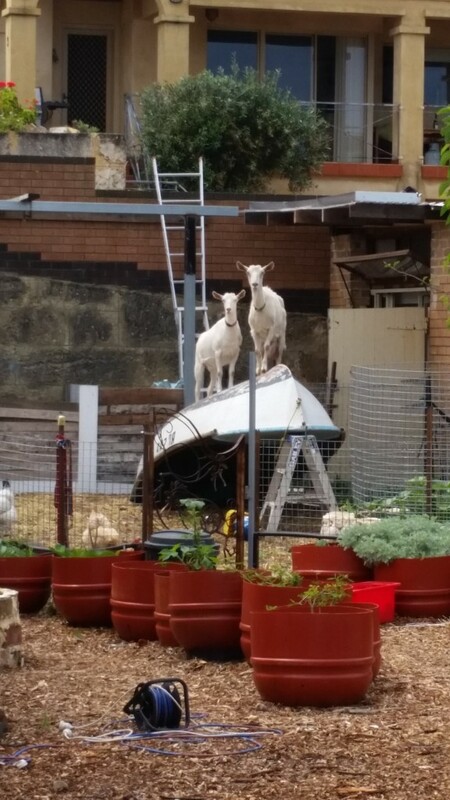 What would you say to someone thinking of getting goats in an urban environment? I would recommend to have a “goat mentor” – ideally someone close by who has a small herd and is willing to support you. 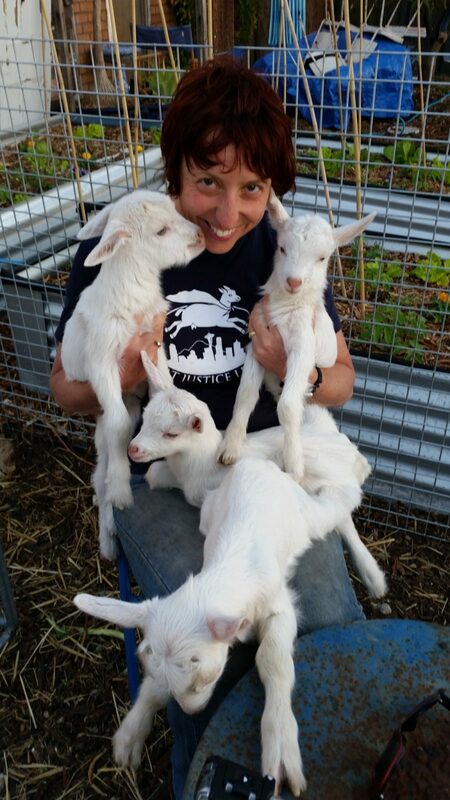 We have Keren Mustham from Serendipity Goats. 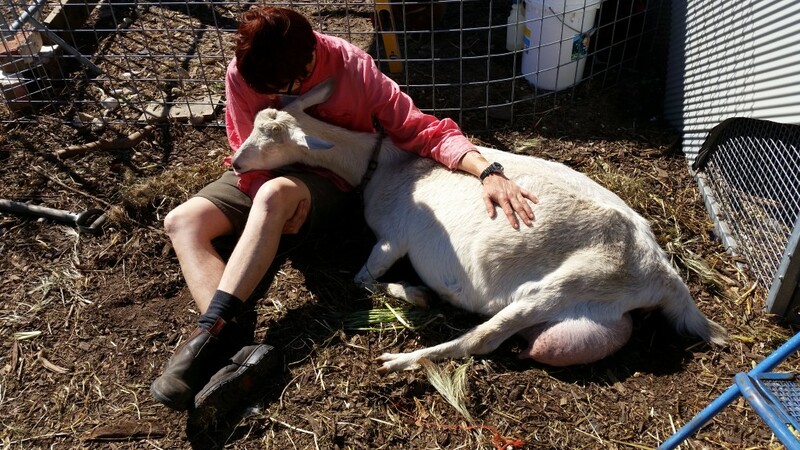 She is an absolute legend – we call her ‘Goat Girl’. What’s one of your favourite things about keeping goats? ​One of my favourite daily things: Sitting in the goat pen early in the morning, drinking a cup of tea and having a warm goat cuddle up against you​. My all time favourite moment: The honour of helping Little White birth her babies. When she was in the last stages of labour she just wanted me there. She lay moaning with her head in my lap and we went through each contraction together. 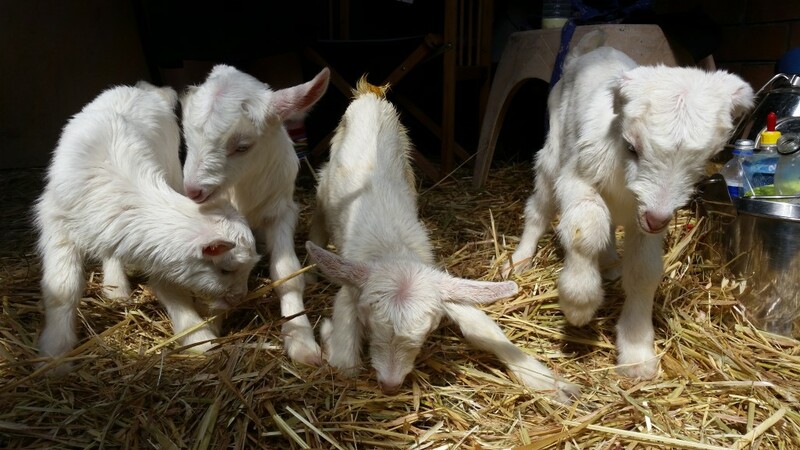 She had six kids (two were still born) – unheard of for a goat. I even had to help her by assisting one out. Since then she and I have had a very special bond​. Goats are very clever and I have used clicker training to great effect. Little White can shake hands and Whimsy can find and touch a​ soccer​ ball on command. Keeping goats is a big commitment, you can’t just spontaneously go on a weekend holiday here and there. You need to make sure someone can milk them/look after them properly. This is getting a bit tricky for us these days. So don’t just go get goats if you like to go away a lot.